Do you still have zucchini coming out your ears? Needing new ideas on how to prepare it? 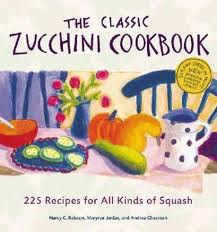 My friend, Debbie, shared The Classic Zucchini Cookbook by Nancy C. Ralston and I think I'm in love. And wouldn't you know it? Storey Publishing has once again put together this awesome book. While most of the recipes concentrate on zucchini, there are plenty more entries for all kinds of squash. And they all looked delicious (not something you find in most cookbooks)! So I copied one down and gave it a try. You really should, too, as it was very tasty. Be sure not to omit the tomatoes or feta because this is what really makes this dish! In a medium bowl, combine tomatoes, garlic, oil, sugar, mint, and oregano. Arrange a layer of zucchini in the bottom of the baking dish. Cover with a layer of the tomato mixture and follow with a layer of onions. Repeat until all veggies are used. Sprinkle the top with feta cheese and then top with the bread crumbs. Finally dot the top with butter. Bake 45 minutes or until squash is tender. Serve hot. So, how are you using your zucchini this year?